One of the greatest joys I have is to carry my granddaughters in my arms as we go exploring around the house. I will still gladly pick them up in my arms carry and them around even when they start walking because carrying them around is much more fun for the both of us! 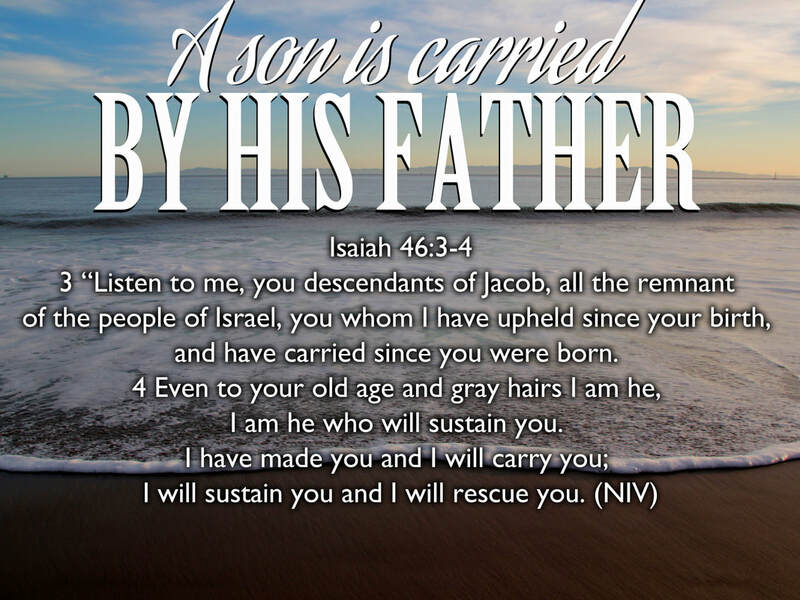 In this week's blog, I want to talk about how our Father carries us in the same way. It is not only in the times when we fall down and scrape our knee that He picks us up, but in reality He is carrying us all of the days of our life! Whether we are sitting on top of His shoulders in the mountaintop experiences in our life or when we are nestled close to His breast in our times of greatest sorrow, He is always close and He is always holding us. Just like little kids who are working alongside their dad are oblivious that it is their father that is actually doing the work, we often take credit for things that our Papa is doing for us (and in us) while we are snuggled away in His big strong arms. In this week's focus Scripture from Isaiah 46, the Lord reminds Israel that He has carried them from the moment of their conception to their old age. There was never a day when His abiding presence was distant and there was never a day when they were left on their own to figure things out. Whether they were aware of His nearness is another story. Much of the Bible is filled with reminders of who God is and the stories from previous generations were meant to be passed down to encourage and strengthen believers in the truth that God was closer than they thought. When Jesus said that the truth would set us free (John 8:32), the Greek word for truth also means 'reality'. The more that we realize the reality of how close our Heavenly Papa is to us through thick and thin, the more that we will feel comforted in knowing that we aren't left to our own devices. The more that we can sink into the reality that His strength that carries us even in our greatest times of weakness, the less we will depend on our own counterfeit strength to navigate through life (2 Corinthians 12:9-10). I'm sure at times Israel felt like they were all alone especially in the times of great opposition but the truth (reality) was that their God and Father was carrying them the entire time! My prayer today is that we would all be reminded that we are never living a life apart from the big, strong arms of our Dad. May we all have a fresh awareness of how the Ancient of Days sees us as His little kids whether we are 2 or 92! From the moment of our arrival on planet earth, He is the one who is carrying us and He is the one that will continue to rescue us because He is an ever present help in our time of trouble (Psalm 46:1). From God's perspective, we are just helpless little lambs who need a Great Shepherd to care for them. In light of this truth, may we stop resisting our own weakness so that we can come to terms with the reality of the gospel. We are just dumb little sheep who need the goodness of our Shepherd to do for us the many things that we cannot do for ourselves. The more that we embrace the glorious simplicity and beauty of being carried by Almighty God, the less the fear, anxiety, striving, etc. will have room to distract us from enjoying our unique vantage point in the embrace of our Abba. So close your eyes, picture yourself in His arms right now and just sink into his goodness in this very moment. The truth (reality) is that He is carrying you whether you are aware of it or not.